Bucolic diaeresis is a term in epic poetry relating to the dactylic hexameter. In Greek, bucolic diaeresis means "herdsman", since the dactylic poetry of herdsmen featured such line endings. It's a place in the rhyme scheme between the fourth and fifth feet after which a "dum-diddy dum-dum" line follows. 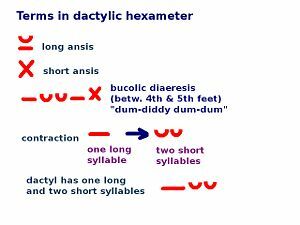 Selected terms relating to the dactylic hexameter. This page was last modified 01:46, 31 March 2010.